Astronomy is a science. It is the study of the objects in the Universe. Stars, planets and comets are examined to determine their structure and origin. As a science it has links with other sciences like mathematics, physics and chemistry. Astronomy treats the Earth as one of millions of bodies in the Universe. Astrology is a belief system. The belief is that the positions of the Sun, Moon and planets against the starry background influences peoples' personalities and shapes their lives. An implicit assumption is that the Earth is a special part of the Universe. This essay discusses these two differing subjects. Astrologers deal with the positions of the planets against the starry background. Astrologers will say Mars is in Virgo therefore this will happen or that will happen. The basis of astrology is the position of the Sun, the Moon and the five naked eye planets against the patterns formed by the stars. These patterns are called Constellations. The Sun, Moon and planets are all labelled as planets by astrologers. This is in line with the original meaning of the word as "wanderers". The Sun and Moon appear larger than the other planets so their influence is larger. The five planets have differing properties. Venus is a brilliant white object in the sky and is named after the Roman goddess of beauty. Mercury is silvery white and moves around the Sun quickly. It is seen as the messenger of the gods. Mars is red in colour. Since this the colour of blood, Mars is considered to be the god of war. Jupiter is the king of the gods because it spends a year in each zodiac constellation. Saturn is the baleful planet because of its relative faintness, its pale yellow colour and its slow movement amongst the stars. Each constellation has a planet associated with it. Astrologers will say something like Taurus is ruled by Venus. Astrology is based on birth charts for an individual. The position of the Sun, Moon and planets is plotted on the zodiac at the moment of birth. The constellations that are rising and setting are also listed. The astrologer will then use this information to determine the personality and attributes of the individual. In actual fact, the constellations are artificial areas in the sky invented originally by humans. They are based on star patterns visible from Earth. All the stars in a constellation are scattered at random in space. The patterns have no real significance. Each culture uses its own patterns. Where the West uses names like The Bull and The Scorpion, the Chinese use The Rat or The Snake. The constellations are still used by astronomers because they are convenient. It is easier to say that Mars is in Virgo than to say Mars has coordinates -5 degrees South, 177 degrees West. Can you recognise the shape? It is actually Aquarius. None of these stars are close together in space or related to each other or similar to each other. It is human imagination that associates water with this group of stars. This is Leo. With a bit of imagination you can imagine a male lion sitting on the ground with its maine. 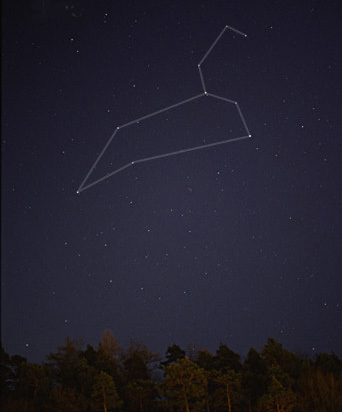 This constellation was named by the Babylonians who saw it as an animal they were familiar with. Lions were then common in Asia as well as Africa. If a civilisation was observing from (say) Australia, this group of unrelated stars would not even resemble a lion. It looks more like a boat. In addition there were no lions in Australia for it to be named after. Constellations are not just human inventions - they are Northern Hemisphere biased. This makes astrology a cultural rather than a cosmological activity. The constellations have as much reality in the sky as the countries have on the Earth. They are used in a similar way. It is easier to say that London is in England rather than London has a Latitude of 51 degrees North and a Longitude of 0 degrees West. Constellations, like countries, are human inventions. There is another point of confusion. 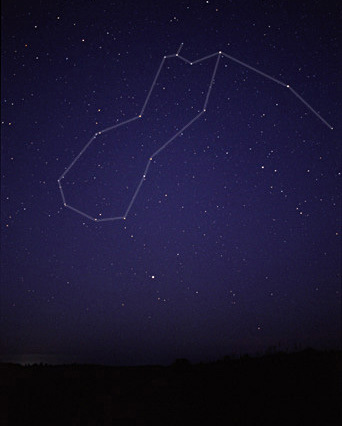 The constellations that astronomers use to identify parts of the sky are not the same as the Zodiac signs used by astrologers. The Zodiac signs were based on the constellations 2000 years ago when their modern (Latin) names were first used. The Signs are an astrological convenience ignoring the differences between two different types of solar calendar. This is described further in The Calendar. The astrological signs are about a month out from the astronomical constellations. When an astrologer says the Sun is in Cancer, an astronomer will look for the Sun in Gemini. If Mars is in Virgo, astronomically it means that, if you look at the group of stars known to the Western cultures as Virgo, you will see an extra red star-like object amongst those stars. That will be Mars. However when an astrologer says that Mars in is Virgo, he is talking about the abstract astrological sign that has no physical significance. Mars will actually be in Leo. The difference in the two solar calendars is caused by an astronomical phenomenon called precession. An astrologer would make predictions based on the position of Mars in an imaginary sign. An astronomer would be able to point out Mars; it would be found amongst the stars of Leo. Moden mobile (cell) phone Apps like GoogleSky allow users to point to the Sun and see which stars it is close to. Anyone can do that and compare to where astrological dates say the Sun should be. Because astrology is more akin to a religous belief, even evidence like this would normally be ignored. But even to say Mars is IN Leo is incorrect. Mars would be in the same direction as the stars of Leo. These are themselves at different distances. It is a bit like holding a hand against a building saying the hand is IN the the building. The brightest star of Leo is called Regulus (a Latin word meaning "ruler"). In 2012, the planet Mars could be seen very close to this star. However they were not really close together. Light from Mars was taking less that five minutes to reach the Earth, while the light from Regulus required 77 years. the signs of the zodiac are created by humans and do not exist in the Universe. Astrologers invented the signs of the zodiac (as distinct from the constellations) after the effects of precession became generally known. If the constellations can be likened to the Earth's countries (France, USA, Namibia) then the signs of the Zodiac can be likened to ancient kingdoms that no longer exist (Babylonia, Ottoman Empire, Phoenicia). Each Zodiac sign is 30 degrees wide in the sky. This is how astrologers have defined them. The astronomical constellations are all of different sizes, much like countries on the Earth. Some astrologers will say that a particular zodiac sign represents the essence of a particular time of year, much like a seasonal effect. But each hemisphere of the Earth has different seasons at the same time of year. Some areas of the Earth have four seasons (Spring, Summer, Autumn, Winter) while other areas have two (Wet, Dry). The stars do not cause the seasons. They are convenient markers for the apparent path of the Sun around the starry sky. I say apparent because the Sun's movement through the zodiac is really due to the Earth moving around the Sun. The seasons are caused by the Earth's equator being tilted by 23 and a half degrees from the plane of the Earth's orbit around the Sun. On 21st June the Northern hemisphere passes through the Summer Solstice. 2000 years ago the Sun would have been in front of the stars that we call Cancer at this solstice. Hence the Tropic of Cancer. In fact at this solstice now the sun would be in Gemini. If a Total Eclipse of the Sun were to occur at the solstice, the stars of Gemini would be visible around or near the sun. In astrology, a person's "star sign" is one of the 12 zodiac signs that the Sun is in on the birth date. The dates for the Sun's passage through each sign are well known. In astronomy, the Sun actually passes through 13 constellations in the sky. The table below lists the actual dates that the Sun is within these constellations in the early 21st century, beginning with Spring in the Northern Hemisphere. All seasonal notes are for the Northern Hemisphere. The dates will change by one day every 70 years. Incidentally, the word zodiac means circle of animals in Greek. Pisces The Fishes 12 Mar 18 Apr The Northern Hemisphere Spring Equinox occurs when the Sun is in this constellation (20 to 22 March). Originated in Babylonia and formed from the combination of two earlier constellations. Very faint stars. In China it is three constellations including a house and marshes. Aries The Ram 18 Apr 14 May Originally Greek (the ram with the golden fleece). It features a line of three stars. 2000 years ago, the Spring Equinox occured when the Sun was in this constellation. It was a prince to the Assyrians. To the Babylonians it was a farm hand. It became a ram after the animal begun to be sacrificed at this time of year. In China it is a pair of inspectors. In the Marshall Islands it is a porpoise. In ancient Egypt this part of the sky was associated with the god Amun-Ra. To the Chinese it was several constellations including a sickle. To the Hebrews it was Simeon. Taurus The Bull 14 May 21 Jun Known to the Minoans, Egyptians, Hebrews and Mesopotamia. To the Grreks it was the god, Zeus, in bull form in order to abduct a Phoenician princess. It is a very prominant constellation with two bright star clusters: The Pleiades (or Seven Sisters) and The Hyades. Its brightest star is Aldebaran ("eye of the bull" in Arabic). The bull and seven sisters appear on cave paintings in France dating back 15,000 years. For many Australian peoples, the Pleiades was the Seven Fishermen in a boat. Gemini The Twins 21 Jun 20 Jul The Twins, Castor and Pollux. To the Greeks they were sons of Zeus: one was immortal and the other wasn't. The Northern Hemisphere Summer Solstice occurs when the Sun is in Gemini (21 to 22 June). The Northern tropic should now really be called the Tropic of Gemini. This is a prominant constellation above Orion. In China it is two constellations: The White Tiger and the Vermillion Bird. In India it was the Two Chariots. Both Uranus (1781) and Pluto (1930) were discovered among the stars of Gemini. Cancer The Crab 20 Jul 10 Aug A small dim constellation with a pretty star cluster, Praesepe (The Beehive). It occurs in the story of the Greek hero, Hercules. To the Akkadians it was known as the Northern Gate of the Sun. The Egyptians identified it with the god, Anubis. In China it is part of the Vermillion Bird. Leo The Lion 10 Aug 16 Sept A large distinctive constellation. It also occurs in the story of Hercules. Its brightest star is Regulus (Latin for "ruler"). It has been depicted as a lion in many Northern Hemisphere cultures going back 6000 years. Virgo The Virgin 16 Sept 31 Oct The largest constellation of the zodiac. To the Greeks it was Demeter, the corn goddess. Its brightest star is Spica (Latin for "ear of corn"). The Northern Hemisphere Autumnal Equinox occurs when the Sun is in Virgo (22 to 23 September). To the Babylonians it was the Furrow and was associated with agriculture. Libra The Scales 31 Oct 23 Nov A small, faint constellation. Originally it was the claws of the scorpion but the Romans changed it to a balance or scales because the Autumn Equinox (when the days and nights are equal in length) occured with the Sun in this part of the sky 2000 years ago. It is the only non-living zodiac constellation. In India it was known as the Hand. Scorpius The Scorpion 23 Nov 29 Nov To the Greeks, this is the scorpion that killed Orion, the Hunter. In the sky, Scorpius rises as Orion sets so the two are never visible together. It is a spectacular constellation, especially from the tropics or the southern hemisphere and one of the few that resembles the animal it is named after. Its brightest star is Antares, Greek for "rival of Mars" because of its prominant red colour. 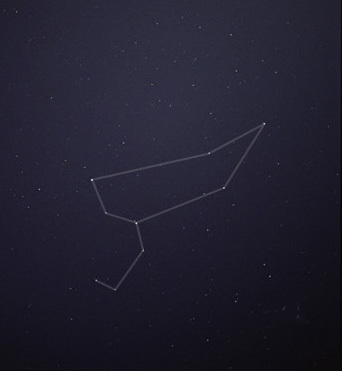 To the people of Java the constellation is called the Brooded Swan. For the Guringai people of Australia, this was part of a large constellation called the Emu. The name, Scorpio, is only used by astrolgers. Ophiuchus The Serpent Bearer 29 Nov 18 Dec This is the Greek god of medicine, Asclepius, who is depicted holding a serpent, a traditional symbol for healing. This region of the sky contains many star clusters, the Milky Way and Barnard's Star, the nearest star to the Earth in a Zodiac constellation. Although the Sun passes through this constellation it is ignored by astrologers. To the Babylonians it was Nirah, a serpant god. Sagittarius The Archer 18 Dec 19 Jan This is Crosus, son of the Greek god, Pan, and the inventor of archery. This part of the sky contains the brightest portion of the Milky Way as it looks towards the centre of our Galaxy. It is not well seen from the Northern Hemisphere. The Northern Winter Solstice occurs with the Sun in this constellation (20 to 22 December). The Southern tropic should now be called the Tropic of Sagittarius. To the Babylonians it was the centaur-like god, Nerigal. Capricornus The Sea Goat 19 Jan 16 Feb A small dim constellation. It originated in Babylonia as a "goat-fish". In 1846 the planet Neptune was discovered in this part of the sky after predictions by mathematicians who had studied orbital irregularities in the movement of Uranus. Aquarius The Water Bearer 16 Feb 11 Mar Another dim constellation originating in Babylonia. At that time it was the rainy season when the Sun passed through this part of the sky. It was associated with the god Ea who is depicted holding a vase of water. The constellation was previously a goose and a peacock. In China it was the Army of Yu-Lin. Astrology is based on a number of assumptions that have been discredited in the last 2000 or so years. It was formulated when the sky was thought to be a crystal sphere centred on the Earth with the stars placed on this sphere. The stars and planets were thought to be gods in orbit around the Earth. The Earth was thought to be the centre of the Universe. The Earth was made of four so-called elements (earth, fire, air and water) while the heavens were made of a fifth element, the aether. This was the basis on which astrology was formulated. We now know that the Earth is one of eight major planets in orbit around the Sun which is itself an ordinary star no different to the other stars in the sky (except closer). We also know that there are more than four elements (closer to 100, see The Elements). More importantly we know that the stars and planets are made up of the same elements that we find on Earth. We are PART of the Universe. In the past there was no difference between astrology and astronomy. The two grew up together in a world of spirits, gods, ghosts and mysticism. Many people believe that the ancients had knowledge that has been lost. Some ancient ideas were remarkably accurate. Others were totally wrong. There are many examples of this. Below are tables showing a selection of ideas by two Greek scientists Aristotle and Pythagoras. Correct ideas are marked by a green tick ("check" in USA); incorrect ideas are marked with a red cross. Only by observing nature can an idea be verified or not. You cannot use the fact that something was believed by the ancients to verify an idea. You cannot say that something is correct because lots of people believe it. For most of history people believed the earth was flat! You cannot say that something is true because a famous scientist believes it. Isaac Newton discovered the laws of gravity (correct) and also wrote books about angels. You cannot say that angels exist because a genius like Newton believed in them. You cannot say the laws of gravity are correct because Newton says so. The laws of gravity are verified by observing objects travelling under the force of gravity and seeing if their paths are the ones predicted by these laws. There is no other way. Albert Einstein's Relativity Theory is considered one of the greatest achievements of human thought - but he did not accept many of the results of Quantum Mechanics, the other pillar of 20th century science. You cannot say whether Quantum Mechanics is true by quoting Einstein's dislike of it. Only nature can answer the question is this theory correct. It is important to separate cause and effect. People once noticed that when the Moon was visible, plants died. People believed that moonlight was harmful to plants. In fact it isn't. When the Moon is visible, the sky is clear. When the sky is clear, frost is more likely in the Temperate regions. It is the frost that kills the plants NOT the moonlight. The clear sky (cause) produces frost (effect) which kills plants and also makes the Moon visible (effect). The dead plants and the Moon are both the effects of the clear sky. The Moon and the dead plants are not directly related. Much of astrology is based on this type of reasoning. For all life on earth the Sun is the most important object in the sky. It does not follow that the planets influence the Earth or us. The Moon causes tides (correct). Tides are a pull on the Earth's waters (almost true but not quite right). The human brain is mainly water (correct). Therefore the Moon affects the brain. This argument only sounds good if the listener does not fully understand how tides work. The tidal force of the Moon on the Earth depends on the mass of the Moon and its distance from the Earth. It also depends on the width of the Earth. Remember there are TWO tides per day. So it cannot be just that the Moon is pulling the Earth. The width of the Earth compared to the distance between the Earth and Moon is much much larger than the width of a human compared to that distance. This is difficult to envisage but is mathematically sound. Astronomy is based on the scientific method of observation, deduction and experiment. Astrology is not. All experiments performed on astrology are inconclusive at best, and disprove it at worst. Astronomy is a science that can make verifiable predictions. Astrology's predictions are hit and miss. In fact you get the same results as chance. Monthly sky details for finding the planets and seeing other phenomena like eclipses. A comparison between the Chinese and Western Zodiac.